These cookies are perfect for Christmas gift-giving. 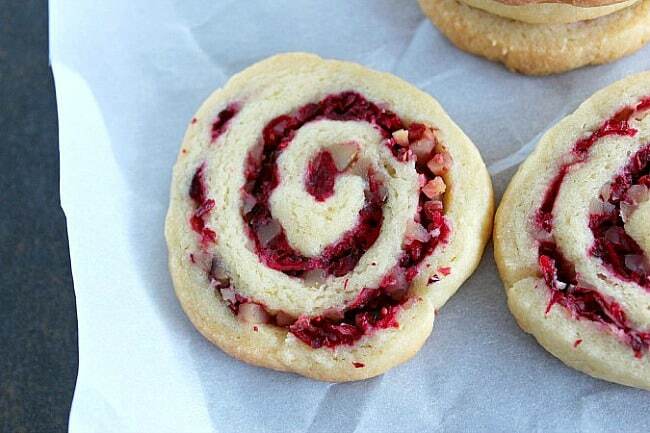 Cranberry Walnut Swirls take no more time than regular, cut sugar cookies, and the presentation is so colorful and festive, be sure to give them in a clear container or cellophane. And they’re not difficult to put together, the cookies can be rolled ahead of time and frozen for up to two months. Crunchy walnuts, tart cranberries and the zest from an orange add just the right tart and sweet flavors that compliment the crispy golden sugar cookie dough. I like to bake these cookies till barely golden but you can make them more crisp to your liking. Leave out the walnuts if you’re not a fan. If you want them to sparkle a little, dip the cookies in regular or colored sugar just before baking. These cookies are winners in our house, year after year. I hope they become a tradition in your house, too. These cookies make such a pretty presentation, you'll want to package them in clear containers. You can use a lot of filling, or just a sprinkling (sprinkling a bit less makes the cookies hold together better in containers). Set oven rack on top position and preheat to 375F degrees. Line a cookie sheet with parchment paper. Sprinkle with cranberry mixture, leaving a 1/2-inch border on 2 opposite sides. 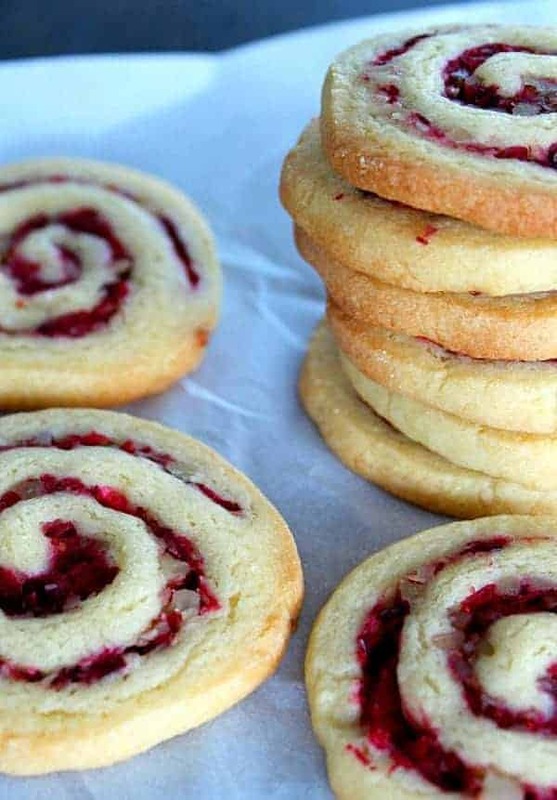 Roll up dough, jellyroll fashion, beginning at a bordered side. Cover and freeze 6 hours or up to 1 month. Cut roll into 1/4-inch thick slices. Place slices on cookie sheet. Bake on top oven rack at 375 degrees for 14 to 15 minutes or until lightly golden browned at the edges. Makes about 30 "pretty" cookies plus extra from the roll ends that aren't as nice looking, but every bit as delicious. How pretty! They are unique too, which I love around Christmas! Pinning!